I only want to send you an email and tell you how much I appreciate your books. I totally love them. 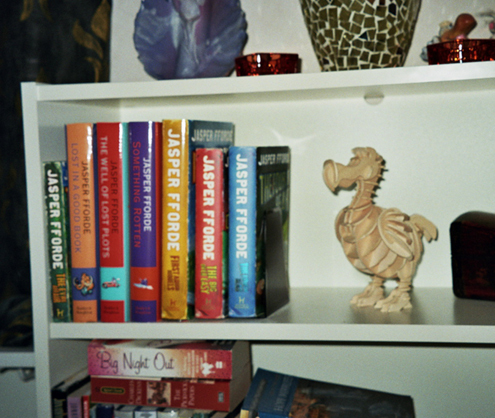 Furthermore I wanted to show you my book guardian. One day I found this nice little fellow in my book shelf . (Well, it did not really happen like that, I had to buy and build him but I have never told him that). His name is Picknick, and he likes it best next to your books, where he says he is looking out for his whimsical cousin Pickwick. Once again thank you for all the wonderful books you have written so far, and I am looking forward to your future books. I know they will totally blow my mind away.